Aerobic endurance development is critical for competitive swimming especially during childhood and adolescence and is frequently tested in swimmers of all ages [1, 2, 3]. In particular, swimming speed corresponding to blood lactate concentration of 4 mmol.L-1 (V4), swimming speed at Lactate Threshold (sLT) as well as the Critical Speed (CS) have been highlighted as the most commonly used indices for assessing swimming endurance [2, 4, 5] and widely used to monitor and develop training programs [1, 5]. Calculation of aerobic indices, such as V4 and sLT, requires the drawing of a speed vs. lactate concentration curve after swimming repetitions of a specific distance (i.e. 200 or 300 or 400 m) with progressively increasing swimming speed [4, 6]. Previous studies examined the effects of training on swimming endurance indices [7, 8] and have reported significant changes in CV and sLT after twelve weeks of training . In this context, Toubekis et al. observed different rate of change in the aforementioned swimming endurance indexes after 14 weeks of training. However, to date no study has compared the rate of changes in swimming endurance capacity in young and developmental age swimmers longitudinally. The changes may be affected by the differences in maturation and metabolic profile during this developmental period [9, 10]. Biological maturity has been proposed as an important factor that may affect the magnitude of training-induced change in endurance capacity in young participants . Additionally, several important biomechanical factors are interacting with biological maturation and may also affect performance . The abovementioned alterations are likely affecting the progress of aerobic endurance during maturation. It is reported that the trainability of endurance and aerobic power are different during maturation and dependent on the pubertal status . Different factors (biological or biomechanical) have been reported in swimming which may affect performance as swimmers mature . However, the effect of maturation on the development of endurance capacity after long-term training in young swimmers is still obscure. Additionally, the aerobic endurance indices that commonly used to evaluate aerobic endurance may not show similar rate of change during maturation. In swimming for instance, Mezzaroba et al. noted that swimming endurance indices may differ in certain ages (12-18 yrs). Importantly, it was found that young swimmers (10-13 yrs) present slower CS compared to sLT, while adolescents the vice-versa . Therefore, the purpose of the present study was to examine the influence of swimming training on V4, sLT and CS after twelve weeks with a comparable training content applied in two successive annual cycles of training. We hypothesized that the rate of change will be altered with increased maturation and this could be different among aerobic endurance indices. Eight swimmers, 5 males and 3 females (age 14.1 ± 1.5, age range: 13-16 years; height: 163.8 ± 9.9 cm; body mass: 55.8 ± 10 kg) participated in the study. All the swimmers had a training background of 3-4 years and trained for 6 sessions per week. The swimmers agreed to participate and parents or guardians signed a written informed consent before the commencement of the study. The study was approved by the faculty review board and conformed to the Declaration of Helsinki. According to the experimental design all swimmers were participating in two successive annual training cycles and were tested at four time-points, two for each training cycle, before and after a 12-week training period (year-1: start-1, end-1 vs. year-2: start-2, end-2; Fig. (1). 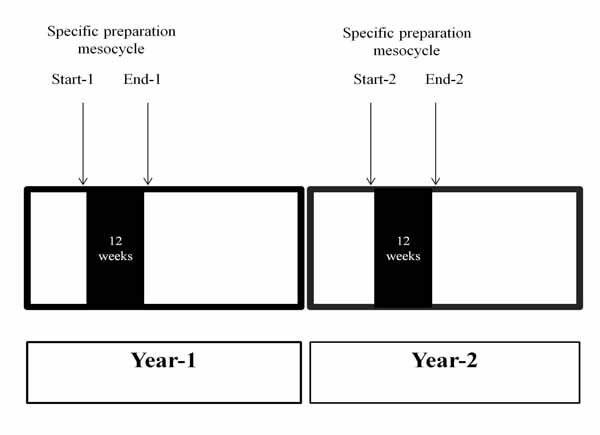 The 12-week training period corresponded to the specific preparation mesocycle in both training cycles. The training content was recorded daily aiming to achieve the same training volume and intensity in both 12-week specific preparation mesocycles. The week before the start and the week after the end of the specific preparation mesocycle in year-1 as well as in year-2 all swimmers were participated in three testing days as follows. Day 1: the swimmers were tested in distances of 50 and 400 m front crawl applying maximum effort and following a 5-min active and 20 min passive recovery between tests. Day 2: a 200-m front crawl maximum effort test was applied. Day 3: all swimmers performed five repetitions of 200 m (5x200-m) at intensities corresponding to 60, 70, 80, 90 and 100% of the 200-m maximum speed, starting every 5 min and 30 s. Fingertip blood samples were taken after each 200-m repetition and were immediately analyzed using the reflectance photometry enzymatic reaction method (Accutrend Plus, Roche, Germany). A standardized warm-up was applied before each testing session (400 m front crawl, 4X50 m freestyle kick, 4X50 m freestyle drill, 4X50 m freestyle progressively increasing speed). All tests were performed in a 25-m indoors swimming pool with a water temperature of 25-26oC. Before the initiation of the experimental procedure an evaluation of the maturation was made according to Tanner & Whitehouse . The biological maturity registered from each swimmer separately at the beginning of the first year of evaluation and at the beginning of the second year of evaluation. Fig. (1). Experimental design applied for the study within two successive annual training cycles (year-1: start-1, end-1 vs. year-2: start-2, end-2). V4 was determined from the speed lactate curve by interpolation of the individual second order polynomial function. sLT was determined by the x-axis projection of the intersection of the lines connecting the two higher and three lower points of the speed-lactate curve [4, 16]. From the three timed distances (50, 200, 400 m), the linear relationship of time vs. distance was drawn and the critical speed (CS) was determined as the slope of the regression line . The training distance was recorded daily and training intensity was estimated using five levels (I, II, III, IV, V). The training intensity levels were identified by the speed-lactate curve. Specifically, level Ι represents blood lactate concentration ~2 mmol.L-1, level ΙΙ represents blood lactate concentration ~4 mmol.L-1, level ΙΙΙ represents blood lactate concentration ~6 mmol.L-1. High intensity swimming that elicits blood lactate levels ~10 mmol.L-1 was defined as intensity IV and maximal intensity sprint swimming as intensity V .
Analysis of variance for repeated measures in three factors was used to compare the speed corresponding to three aerobic endurance indices V4, sLT and CS (3 aerobic endurance indices X 2 years of training X 2 testing times per year). Sphericity was verified by the Mauchly’s test. When the assumption of sphericity was not met, the significance of F-ratios was adjusted according to the Greenhouse-Geisser procedure. Multiple comparisons were made using the Tukey HSD post-hoc test. The student T-test for paired samples was used to examine difference of training volume between year 1 vs. year 2 and the biological maturity for year 1 and year 2. The effect size for paired comparisons was calculated with Cohen’s d using as denominator the pooled standard deviation. The effect size was considered small if the absolute value of Cohen’s d was less than 0.20, medium if it was between 0.20 and 0.50 and large if it was greater than 0.50 . The data have been presented as mean ± sd and the level of significance was set at p<0.05. The biological maturity of the swimmers according to Tanner stage was increased from 3.1 ± 1.1 in year-1 as compared to 4.0 ± 0.9 in year-2 of training Table (1). Regarding the training characteristics, the total distance of training within the 12-week period of training was similar in year-1 compared to year-2 (year-1: 269250 m, year-2: 302225 m, p>0.05). The distance covered in each training intensity level was also similar in year-1 compared to year-2 (Table 1). Table 1. Distance covered (meters: m) in each training intensity level and biological maturity of swimmers (Tanner stage) at year-1 compared to year-2, *: p<0.05. Independent of the evaluation indices used the overall aerobic endurance (considering all three indices together) was improved at the end compared to the start of the 12-week training period and after year-2 compared to year-1 (main effect start vs. end: 1.202 ± 0.077 vs. 1.245 ± 0.077 m∙s-1, p<0.05; main effect year-1 vs. year-2: 1.197 ± 0.086 vs. 1.251 ± 0.070 m∙s-1, p<0.05). No interaction was observed between indices and year of training before and after the 12-week training period (F(2,14)= 0.26, p= 0.77). In year-1 of training V4, sLT, CS were unchanged after 12 weeks of training (V4, start-1: 1.160 ± 0.081, end-1: 1.209 ± 0.083 m∙s-1, d= 0.61, p>0.05; sLT, start-1: 1.168 ± 0.110, end-1: 1.199 ± 0.076 m∙s-1, d= 0.33, p>0.05; CS, start-1: 1.207 ± 0.091, end-1: 1.237 ± 0.125 m∙s-1, d= 0.29, p>0.05). On the contrary, during the corresponding period of preparation during year-2 of training it was only V4 that was increased from start-2 to end-2 (V4, start-2: 1.226 ± 0.076, end-2: 1.287 ± 0.069 m∙s-1, d= 0.84, p<0.05), whereas, sLT and CS were unchanged at the same period (sLT, start-2: 1.215 ± 0.068, end-2: 1.269 ± 0.066 m∙s-1; d= 0.81, CS, start-2: 1.238 ± 0.084, end-2: 1.269 ± 0.76 m∙s-1, d= 0.39, p>0.05; Figure 2). Αt year-1 and year-2, before and after the specific preparation training periods, no differences were observed among V4, sLT, CS (p>0.05, Fig. (2). Moreover, the percentage changes in each one of the endurance indices from the start to the end of the 12-week periods were no different during year-1 and year-2. All three indices showed similar changes after the 12-week period in year-1 and year-2 (V4, year-1: 4.1 ± 2.8%, year-2: 4.7 ± 2.7% p>0.05; sLT, year-1: 2.6 ± 5.6%, year-2: 4.2 ± 2.8%; CS, year-1: 2.2 ± 4.2%, year-2: 2.5 ± 2.0%, p>0.05). The purpose of this study was to compare changes in three well-known aerobic endurance indices, such as V4, sLT and CS following a 12-week training period in two consecutive years. The main findings of the study indicate that: i) aerobic endurance was improved after a 12-week training period and from year-1 to year-2, ii) V4 was increased after 12 weeks of training during year-2 but not year-1, iii) CS and sLT were not changed significantly within the 12-week observation period of year-1 and year-2, iv) in all four testing periods V4, sLT and CS were not different and presented similar rate of change each year. Fig. (2). Changes in speed corresponding to blood lactate concentration of 4 mmol.L-1 (V4), speed at lactate threshold (sLT) and critical speed (CS) in year-1 (start-1, end-1) and year-2 (start-2, end-2) at the corresponding 12-week specific preparation mesocycles. The bars indicate the average value of all three indices combined. *: V4 start-2 vs. end-2, p<0.05; #: year-2 vs. year-1, p<0.05; †: start vs. end in both years, p<0.05. Considering all three indices together the aerobic endurance of swimmers was increased about 3.4% (mean improvement of V4, sLT and CS) after 12 weeks of training independent of year-1 or year-2. Improvements of 2 - 4%, 6.5% and 3.6% in CS, sLT and V4 respectively, have been reported after 12 and 14 weeks of training in previous studies [7, 8]. Such an improvement has been attributed to the effect of progressively increasing volume of training during this cycle of preparation . As seen in Table (1), the training volume at training intensities I, II, and III (mainly aerobic training) was increased compared to other training intensities. Possibly the training volume is an important factor and relates well with changes in sLT during a period of training . The similarity of changes in endurance indices between our study and previous studies is probably attributed to similar weekly volume applied in the aforementioned studies [7, 8]. Besides the improvement following a 12-week training period, the overall aerobic endurance was increased about 4% in year-2 compared to year-1 (main effect considering start and end values together in each year). This improvement was mainly the effect of maturation since the training content within each 12-week period was similar during year-1 compared to year-2. Thus, biological maturity can be an important factor which has influenced the improvements in aerobic endurance. Likewise, Kojima et al. , observed age related variations in physiological parameters of sport performance during adolescence. These variations are attributable mainly to maturity status and size changes (e.g., limb length, height and muscle mass) and become more apparent during and after the growth spurt, especially in boys. Moreover, the improvement of all indices was the same in year-1 compared to year-2 indicating that independent of the maturation stage the trainability of endurance is similar at different maturation stage as it has been reported in previous studies . However, a limitation of the present study is the different maturation stage of each individual and the inclusion of both males and females. This may have led to a greater variation in endurance indices change after the 12-week period of training. Furthermore, we applied only four evaluations during the two successive years of observation. It is likely that changes and differences between aerobic indices could present a different magnitude across training periods. Despite these limitations, it seems that an increase in the biological maturity by one level (i.e. from Tanner stage 3 to stage 4) may be critical for endurance and performance enhancement both in male and female swimmers of this age-group [14, 21]. Despite the overall effect of training on endurance indices it is interesting to discuss the evolution of changes in each aerobic endurance index separately. During year-1 all aerobic endurance indices were improved by 2.2 to 4.1% but this improvement was not statistically significant. To explain this observation, we should consider that all swimmers had already participated in a previous period of 12-week training, namely the period of general preparation, before they participate in the first testing session at the beginning of the specific preparation period in the present study. Then, some improvement was succeeded in the previous preparation period allowing less room for further improvement in the specific preparation period. Previous research showed that V4, sLT and CS demonstrated less improvement in a second as compared to the first training cycle . In year-2 of training in the present study a significant improvement was observed in V4 only. This is confirmed from the large effect size in this index (d= 0.84, large effect). Similarly, sLT showed also an improvement despite not reaching significance (d=0.81, large effect). Such a change could be reflected to a 3-4 s difference for 100 m repetitions during an endurance training set and has practical importance for prescribing training pace. It is likely then, that a specific improvement of endurance around the intensity corresponding to 4 mmol.L-1 lactate concentration and sLT may be achieved. This is possibly the combined effect of training content and biological maturation. A limitation of the present study was that the training intensity levels were controlled by the time to complete each distance in each training session but not with the actual lactate responses. Additionally, the training content at training intensity levels IV and V increased in year-2 compared to year-1 and despite the difference was not statistically significant may have an impact on the metabolic profile of the swimmers and their swimming economy. Increased training intensity may lead to improvement of aerobic endurance and especially the aerobic power and it is likely that the longer distance of high intensity training favored increased lactate production and anaerobic characteristics . 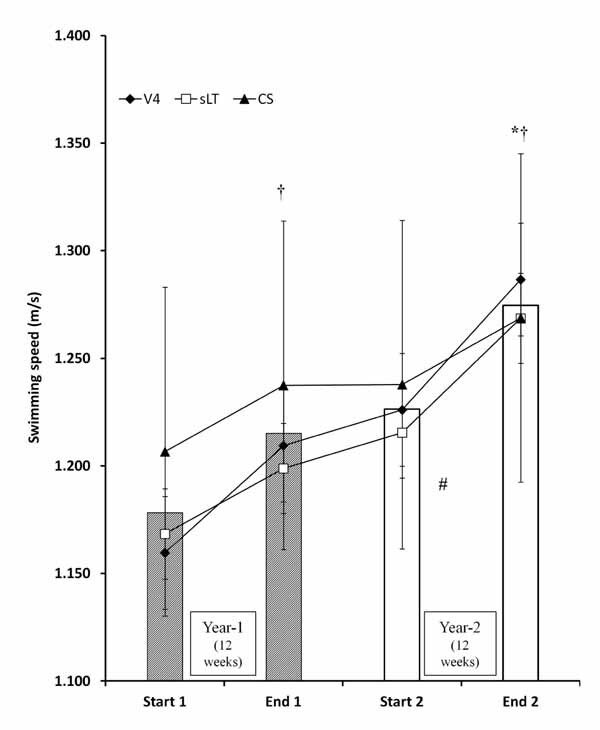 Furthermore, the increased maturation of all swimmers in year-2 may have affected the change of V4 slightly more than sLT since a greater improvement on performance and net lactate production has been observed in more mature compared to less mature swimmers . Besides some percentage variation, the three aerobic endurance indices showed similar trend of evolution and were no different among them at any one of the four testing points in the present study. However, this observation does not indicate that the three indices can be used interchangeably since 1-2% difference in swimming speed could induce different metabolic responses during a training set . Comparing the three indices we should consider limitation of the methodology used for their calculation. Briefly, the points used to draw the speed-lactate curve, the mathematical model used to calculate the sLT or the interpolation method used for V4 location (i.e. linear or polynomial) [16, 24] and finally the distances used to derive CS [16, 25, 26] are all affecting the results. In successive training years and during the specific preparation period the aerobic endurance indices are improving by ~2-4% each year and are not different among them. This indicates that trainability of aerobic endurance is similar during the maturation period and specifically after a one unit of Tanner stage change. The aerobic endurance indices change similarly throughout a two-year training, independent of the maturation but coaches should not use them interchangeably as even slight differences could impose a different training load to young swimmers. Possibly, V4 is more sensitive to detect training adaptations during the specific preparation period in young swimmers. The approval of the ethical committee with a reference number of approval 1007/26-4-2017 provided by the Ethical committee of the School of Physical Education and Sport Science. The authors would like to thank the swimmers for their voluntary participation in the long duration of the study. Dekerle J, Pelayo P. Assessing aerobic endurance in swimming.World Book of Swimming From Science to Performance 2011; 277-96. Maglischo WE. Swimming Fastest 2003. Mezzaroba PV, Papoti M, Machado FA. Comparison between lactate minimum and critical speed throughout childhood and adolescence in swimmers. Pediatr Exerc Sci 2014; 26(3): 274-80. Pyne DB, Lee H, Swanwick KM. Monitoring the lactate threshold in world-ranked swimmers. Med Sci Sports Exerc 2001; 33(2): 291-7. Toubekis AG, Tokmakidis SP. Metabolic responses at various intensities relative to critical swimming velocity. J Strength Cond Res 2013; 27(6): 1731-41. Fernandes RJ, Sousa M, Machado L, Vilas-Boas JP. Step length and individual anaerobic threshold assessment in swimming. Int J Sports Med 2011; 32(12): 940-6. Machado M, Junior O, Marques A, Colantonio E, Cyrino E, De Mello M. Effect of 12 weeks of training on critical velocity and maximal lactate steady state in swimmers. Eur J Sport Sci 2011; 11: 165-70. Toubekis AG, Tsami AP, Smilios IG, Douda HT, Tokmakidis SP. Training-induced changes on blood lactate profile and critical velocity in young swimmers. J Strength Cond Res 2011; 25(6): 1563-70. Armstrong N, McManus AM. Physiology of elite young male athletes. Med Sport Sci 2011; 56: 1-22. Baxter-Jones AD, Eisenmann JC, Sherar LB. Controlling for maturation in pediatric exercise science. Pediatr Exerc Sci 2005; 17: 18-30. Erlandson MC, Sherar LB, Mirwald RL, Maffulli N, Baxter-Jones AD. Growth and maturation of adolescent female gymnasts, swimmers, and tennis players. Med Sci Sports Exerc 2008; 40(1): 34-42. Morais JE, Marques MC, Marinho DA, Silva AJ, Barbosa TM. Longitudinal modeling in sports: young swimmers’ performance and biomechanics profile. Hum Mov Sci 2014; 37: 111-22. Baquet G, van Praagh E, Berthoin S. Endurance training and aerobic fitness in young people. Sports Med 2003; 33(15): 1127-43. Lätt E, Jürimäe J, Haljaste K, Cicchella A, Purge P, Jürimäe T. Longitudinal development of physical and performance parameters during biological maturation of young male swimmers. Percept Mot Skills 2009; 108(1): 297-307. Toubekis AG, Tsami AP, Tokmakidis SP. Critical velocity and lactate threshold in young swimmers. Int J Sports Med 2006; 27(2): 117-23. Wakayoshi K, Yoshida T, Udo M, et al. A simple method for determining critical speed as swimming fatigue threshold in competitive swimming. Int J Sports Med 1992; 13(5): 367-71. Mujika I, Busso T, Lacoste L, Barale F, Geyssant A, Chatard J-C. Modeled responses to training and taper in competitive swimmers. Med Sci Sports Exerc 1996; 28(2): 251-8. Kojima K, Jamison PL, Stager JM. Age classification is USA swimming: Are current competitive age-groups appropriate? Med Sci Sports Exerc 2009; 41(5): 148. Lätt E, Jürimäe J, Haljaste K, Cicchella A, Purge P, Jürimäe T. Physical development and swimming performance during biological maturation in young female swimmers. Coll Antropol 2009; 33(1): 117-22. Sperlich B, Zinner C, Heilemann I, Kjendlie P-L, Holmberg H-C, Mester J. High-intensity interval training improves VO(2peak), maximal lactate accumulation, time trial and competition performance in 9-11-year-old swimmers. Eur J Appl Physiol 2010; 110(5): 1029-36. Toubekis AG, Vasilaki A, Douda H, Gourgoulis V, Tokmakidis S. Physiological responses during interval training at relative to critical velocity intensity in young swimmers. J Sci Med Sport 2011; 14(4): 363-8. Ribeiro JP, Cadavid E, Baena J, Monsalvete E, Barna A, De Rose EH. Metabolic predictors of middle-distance swimming performance. Br J Sports Med 1990; 24(3): 196-200. Wakayoshi K, Ikuta K, Yoshida T, et al. Determination and validity of critical velocity as an index of swimming performance in the competitive swimmer. Eur J Appl Physiol Occup Physiol 1992; 64(2): 153-7. Fernandes R, Vilas-Boas JP. Critical velocity as a criterion for estimating aerobic training pace in juvenile swimmers.Biomechanics and Medicine in Swimming VIII 1999; 233-8.